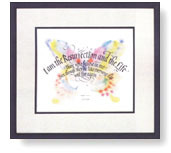 Butterfly by Timothy R. Botts depicts the image of a butterfly to symbolize new life and illustrates Christ's statement to Martha, the sister of Lazarus, before Jesus raised Lazarus from the dead. "I am the Resurrection and the Life. Those who believe in Me even though they die like everyone else will live again." This print was issued & released in 2002. Framed Size: 17.5" x 20.5"
Comes in your choice of a gold or wood frame with off-white matting. Butterfly copyright © 2002 by Timothy R. Botts is prohibited from being copied. All applicable copyright © laws apply and are reserved by artist Timothy R. Botts.